Bridesmaid Gift Ideas by Jewels 4 Girls. Bridesmaids are such a special part of any bride's wedding day. Jewellery gifts are a lovely way to say "thank you" with a meaningful gift that your bridesmaid will want to keep and treasure. We have many unique bridesmaid gift ideas to make your gift extra special. For young girls our personalised bracelets and necklaces with names make lovely presents for bridesmaids and flower girls. If you're looking for a little trinket we have name bracelets from just £5.99 or for something extra special our luxury Sterling silver name bracelets start from £32.99. Luxury bracelets all come with a white leatherette gift box inside gift packing for the perfect finishing touch. Another popular request we get here at Jewels 4 Girls is for wedding jewellery and thank you gifts to be made in the wedding colours. This may be so the recipient can wear their special gift on the day or may be just a sentimental reminder of the colour theme of the wedding. Bracelets and necklaces with engraving are always popular because you can add the date of the wedding along with any names or words of your choice to your gift. You may wish to have the bride and grooms names engraved i.e. "Love from John & Sarah" on one side of the charm. 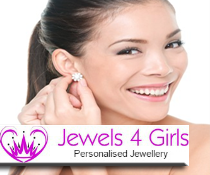 All our personalised wedding jewellery and personalised bridesmaid gifts can be adapted to suite your preferences. So please feel free to contact us any time with your enquiries.